eventually applying the same science to planetary atmospheres. Recall that the diagram of lapse rate posted last week showed some pretty idealized and linearized plot of temperature vs. altitude. I found some description as to this behavior, most of which I still don't quite understand, but it has to do with the varying composition of the atmosphere with altitude and the varying levels of absorptions of radiant energy from the sun, which depends strongly on the wavelength of the radiation. The heat balance between the various levels, re-radiation of heat to higher levels and absorption of heat from lower levels is the key. Absorption of ultraviolet radiation by oxygen and ozone at high levels can account for the increasing temperature with altitude in several regions. Anyway, it seems pretty complicated and I'm starting to put off further study until later. One of the complications is the dependence on the planet's latitude when it comes to the amount of radiation from its star is absorbed. Check out the plot, below, found again in Byers, "General Meteorology". Curve I shows the amount of incoming radiation and curve II shows the amount of outgoing radiation. Curve II is calculated from the blackbody radiation based on the planets temperature. 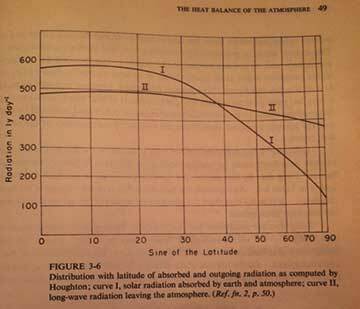 The area between the two curves shows in the case at low latitudes that the net balance is for more radiation absorption and for higher latitudes the exact opposite occurs. The two areas are almost nearly always equal, which represents thermal balance, but the fact that the heat occurs in different regions of the planet is what is responsible for winds as these large areas cause movement toward equilibrium. The rotation of the planet introduces a whole new set of forces that makes the situation much more complicated. Another study item that came up this week is from the book, "Universe or Multiverse", edited by Bernard Carr. If you are interested in cosmology this is a good place to check out some of the latest conjectures about the uniqueness of the universe. Is the universe unique or just one of many universes? One of the chapters in the book is written by MIT cosmologist Max Tegmark, also the author of "Our Mathematical Universe". 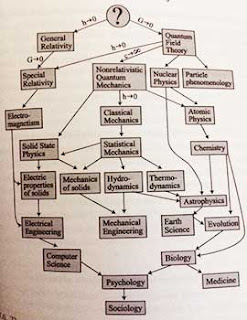 I was fascinated by a diagram in the book, shown below, which lays out his conjecture about how the whole existing body of physics and science would flow down and be derived from the very top "theory of everything" . Now who knows if any such thing as a theory of everything will ever be found? But my interest in the diagram is that not by starting at the top and flowing down but if you consider starting at the bottom and then moving towards the top, that that is a good description of my study history in physics. We all start at the bottom and then our journeys take us on a path as we move upward by studying the various sciences. In order to begin to understand the ultimate theory of everything you must make the upward slog through all the other known physics and science. In my case, my serious study started in the portion of the diagram associated with electrical engineering. Then my journey and path as a physicist wannabe went through classical mechanics, so that I could better understand special relativity. Up to that time, I mistakenly held the view that special relativity had to do with just very fast speeds and certain paradoxes involving twins. No, no, no, it is much more fundamental than that. The fundamental part of special relativity is that the laws of physics must be written in a form so that the laws remain invariant for all observers, observers that happen to be moving at high velocities relative to other observers. Making sure that the formulation of the laws of physics meets this criterion is the foundation of much of modern physics. No, its not just about twins and the distortion of space and time is not a paradox but a real aspect of our universe. In fact we can already see that time, space, gravity and light are all bound up together in the relationships described by general relativity. Then with some introductory understanding of special relativity, you can go further up the diagram and start to tackle general relativity. Now I initially thought as an engineer my mathematical background would have been pretty good, but, no, to tackle gravity as described in general relativity requires more mathematics, like tensor analysis. Then there is the other half of the upward slog to the theory of everything and that is the quantum mechanics side of physics. This has been another slow and hard slog uphill just to get a basic understanding of what is going on. My latest adventure was in going over quantum field theory was is quite hard material. Luckily, I've had the acquaintance and help from other retired physicist wannabes and friends who are journeying much on the same path. Thank you folks! Now, after being thoroughly worn out from that adventure, let's briefly go over the failed attempt to get a picture of Neptune. I decided to use the little alt/az mount, because it is easier and faster to set up than the big scope and I figured that with long exposures and just the 600 mm lens, we should get at least something like a pale blue dot for Neptune, which is a quite dim 7.8 magnitude. Uranus is a little brighter with 5.7 magnitude, but it rises later than Neptune, but could also be the next target for trying to capture the dimmer planets..
Now this has probably happened to you too where you get your scope setup and only then do you realize that there is an obstacle that very quickly gets in your way to complete your alignment. I had checked to make sure that I would have a clear line of site view of Neptune, but soon discovered that my favorite alignment starts, Antares and Arcturus, were going to go below the roof tops before I could compete the alignment. What to do? I could have move my observing location 20-30 feet away, but then I would give up all my tripod leveling work and have to do that all over again. So, I decided to just try a single object solar system alignment using Saturn. As you know, to get a pretty good alignment we want to use two or three stars and maybe a couple of more calibration stars. How bad or how convenient would an alignment be based on using just the position of Saturn? 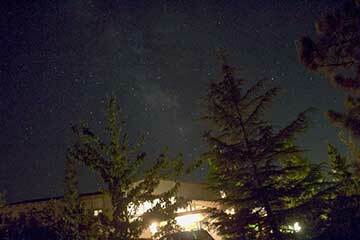 Well, it turned out it was not too bad, just off by a couple of degrees, as it turned out. So, I slewed the scope to the calculated position for Neptune and took a couple of images. 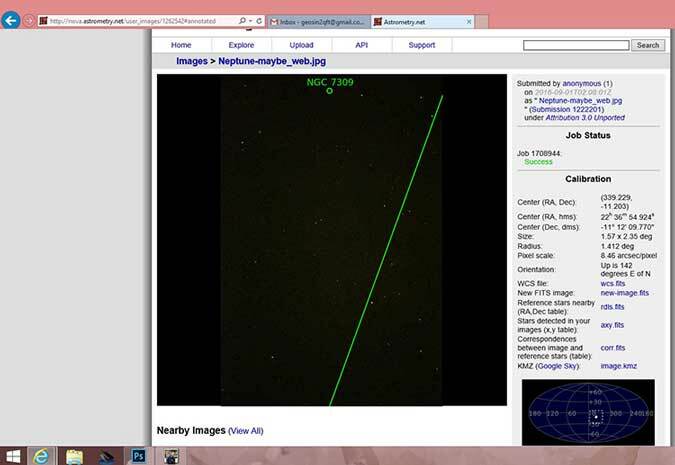 I couldn't see anything on the camera that looked like planet, so after I closed up shop and went back inside, I uploaded the image to astrometry.net and got back the real location the camera was pointing. See below. The screenshot shows that the actual center of the image is located at right ascension = 22 hours, 37 minutes and declination = -11 degrees, 12 minutes. No planet there it seems. The green line at least shows the location of the ecliptic so its not too far off location. So, looking up the RA and Dec for Neptune, we find RA = 22 hours 50 minutes, Dec = -8 degrees 23 minutes. So, I was only off 13 minutes in RA and 2 degrees 40 minutes in Dec. And, the sad news is that Neptune would not be in the camera image. So next time, I'll get something more like at least a two star alignment and maybe cut the lens focal length in half so that the field of view is twice as big to allow for a higher probability of capturing the planet. Of course, my goal is to just get a better alignment so that the scope can more accurately just be slewed to the correct location and take the picture. Better luck next time!